I’ll admit this right now to my readers: Clowns are not my favorite thing. I’m not afraid of them but creepy clowns scare me (Thanks a lot, American Horror Story: Cult). So when I saw that Stephen King’s It was getting a remake, I”ll admit that I wasn’t going to be flocking to the doors of my favorite theater to see it. Horror films just aren’t my thing. But after hearing some friends’ opinions on the film, ranging from ‘not scary’ to ‘excellent’ to ‘terrible’, what did I have to lose? 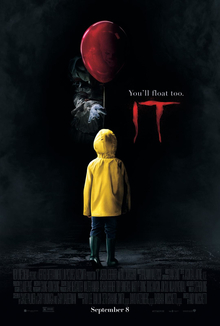 It tells the story of seven children in Derry, Maine, who are terrorized by a sewer-dwelling, shapeshifting demon, taking the appearance of a clown. The kids must band together to not only kill the evil clown, but save all the disappearing children. Watching this movie, I was reminded of the humor and energy of children actors. Child actors haven’t had a spotlight on them since the 80’s and 90’s of classic Spielberg directed or produced films. The performances of these children definitely carried the heart and humor of this story, no matter how dark it got for the characters. Bill Skarsgard was excellent as Pennywise The Dancing Clown, deserving the praise he has received from critics. He was creepy and entertaining, someone that you didn’t want to see in your nightmares. Skarsgard definitely honored the original idea of Pennywise from the twisted genius of Stephen King. There wasn’t really any jumping scary moments that today’s horror movies, but the moments that get to you are the moments when an adolescent character is separated from their friends, all alone in the cellar or the bathroom or the alley or an office, and something they have long feared comes to ‘life’ in a particular fashion, confirming their worse sense of dread and doom that has come for them. Those are the moments that really sends a chill racing down your spine as you worry if this character will make it through. Director Andy Muschietti created an excellently crafted and effective suspense pieces that will definitely have him on the high list of the next horror movie. There is a reason this movie is the highest grossing horror film in history and I recommend that you check out this entertaining and emotionally effective film.